Since the introduction of its well-being programme in 2010, the Office for National Statistics (ONS) has introduced a number of questions into its surveys in an attempt to measure the well-being of the population in the UK. The Annual Population Survey, the largest regular household survey undertaken by the ONS, now includes a suite of questions related to subjective well-being. These questions ask respondents about overall levels of satisfaction with life, happiness, anxiety and the extent to which respondents thought that the things that they did in life were worthwhile. Estimates produced by the ONS suggests that results for Wales overall are on a par with other countries and regions of the UK. 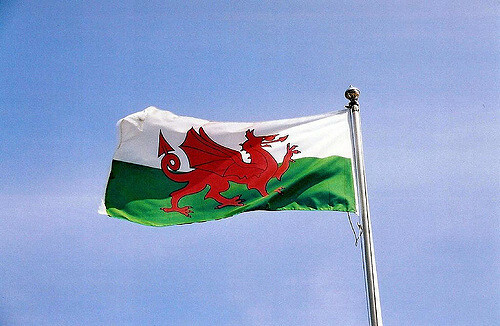 However, there is variation within Wales. Most notably, levels of subject well-being appear to be lower than average within the South Wales Valleys across each of these measures[i]. Happiness at work has also become a popular topic. The Welsh economy is characterized by a high prevalence of low paid and low skilled work, a relatively low employment rate and low value added production. In terms of well-being, these features could give cause for concern. Nevertheless, previous research suggests that workers in Wales are more satisfied with work than their colleagues elsewhere[ii]. This note provides results of further analysis of different measures of job satisfaction that are available from 3 nationally representative surveys of employment that are conducted within Britain to explore whether the earlier findings of higher job satisfaction in Wales can be corroborated. Analysis is based on the Skills and Employment Survey, the Workplace Employment Relations Survey and the British Household Panel Survey. Indices of satisfaction with work can be constructed from these sources based on both ‘catch all’ questions on overall job satisfaction and from more detailed questions that ask respondents how satisfied or dissatisfied they are with particular aspects of their jobs, such as pay, promotion prospects, job security relationships with colleagues etc. More detailed information on the construction of these measures is available from an accompanying Research Note. Figure 1 shows how the derived indices of job satisfaction vary among employees across Britain. The average values of each index have been re-based to 100 so that comparisons between different parts of Britain can be more easily made. An index value of less than 100 indicates below average levels of job satisfaction. 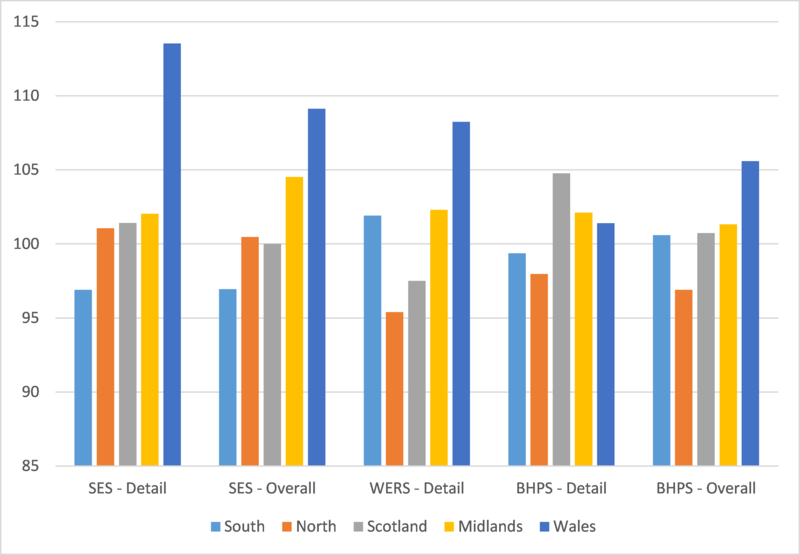 The analysis demonstrates that for four of the five indices of job satisfaction derived from the three survey sources, reported levels of job satisfaction are higher in Wales than across other parts of Great Britain. Employees in the Midlands tend to be the next most satisfied group. Within the SES, employees in the South exhibit the lowest levels of satisfaction. With both WERS and the BHPS, employees in the North exhibit the lowest levels of job satisfaction. There may be a number of reasons for the higher levels of job satisfaction in Wales. Not all of these reasons are necessarily good. The scarcity of work in Wales may contribute to a higher perceived cost of job loss and increased levels of satisfaction among those who are fortunate enough to be in employment. Regional differences in personality traits or otherwise unexplained cultural factors could also influence how people respond to such questions. In the context of high levels to trade union membership, the existence of arguably a better climate of industrial relations in Wales may also contribute to higher job satisfaction – particularly among union members who tend to express lower levels of satisfaction with work. The influence of trade unions on job satisfaction in Wales is a topic of ongoing research being undertaken as part of the Trade Union Membership, Associational Life and Wellbeing project.